Pallavi is an eleventh grade student from Kharagpur, a small town in India that is well known for having one of India’s finest engineering colleges. She and her father aspire for Pallavi to become a great engineer. While many Indian students travel to cities popular for test-preparation coaching in order to have a better chance at acceptance into engineering colleges, Pallavi’s family wanted to explore alternative options for her to receive test-prep help. Pallavi ended up enrolling in a one year, group class with Vedantu. Arjun grew up in the bustling city of Bangalore, India, but when he entered seventh grade, his parents needed to move outside of the city. Part of the decision to move involved his parents ensuring that Arjun would have access to good teachers outside of school. Getting a home tutor was one option, but expensive. When Arjun’s parents heard about Vedantu, the decision to move became easier as they realized they could find a great, online tutor at a fraction of the cost. A large majority of the 260 million K-12 school students in India attend after-school tutoring as parents across age groups and income categories believe in the benefits of education for their children and are willing to invest in it. A 2017 study across 24,000 households in Delhi revealed that 66 percent of respondents opt for private tutoring. This trend is similar for students studying in both private and government schools (69 percent, 63 percent and 61 percent of households sending their children to private, municipal and state government schools respectively opted for tutoring). This $20 billion after-school market is highly fragmented with the majority of students accessing local, neighborhood teachers and adults as tutors, with a wide variation in their quality. There are also well-established tutoring companies which charge $600–800 per year for tutoring and $1500+ per year for test-prep. These prices are not affordable for all population segments. Several edtech solutions have emerged over the last few years to bridge the quality and affordability gap. Most of these products offer recorded content or practice platforms and are used in addition to after-school tutoring. These options unfortunately become the third thing on students’ calendars and parents’ wallets after attending and paying for school and after-school tutoring. Vedantu, however, is the go-to platform for after-school tutoring, enabling access to great teachers all over the country at a fraction of the price. This is why we are excited by Vedantu’s model. Vedantu provides students with online tutoring delivered as individual or group classes through a structured learning program. Vedantu’s platform, which is available to students in even the remotest locations, provides a combination of best-in-class teachers who leverage Vedantu’s robust technology platform along with high quality content to make classes rich and interactive. The technology platform continuously measures engagement and learning data to provide feedback to both teachers and students, enabling a personalized learning experience. Teachers are central to Vedantu’s model and thus Vedantu follows a stringent criteria for selecting and on-boarding teachers, in order to ensure a high quality experience and outcomes for students on the platform. 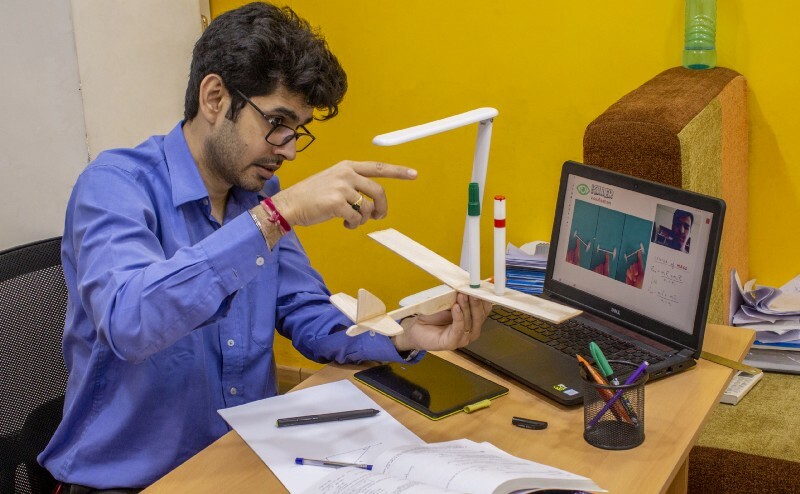 Vedantu is founded and operated by a team of passionate teachers, who have now taught and mentored over 10,000 students since graduating from Indian Institutes of Technology (IITs). Vedantu’s vision is to impact millions of students through a combination of its technology platform and best-in-class teachers. Vedantu’s platform has many high quality, experienced teachers who are experts in their subject matter and online student engagement. These teachers are now able to reach many more students compared to what they were able to do offline. Vedantu also has several first-time teachers who are educated though not gainfully employed. Dr. Vani, BDS by qualification, is the wife of an army officer currently stationed in Tinsukia, a remote town located on the north-eastern border of India. At a recent Vedantu National Teacher gathering, she shared that Vedantu has provided her a channel of connecting with the rest of the country, especially young people, in addition to being a source of additional income. India has the second largest population of internet users in the world with 390 million residents using internet at least once a month. The monthly mobile data consumption is now at 8GB per subscriber as the price for data consumption has come down from $4.5 per GB to $0.17 per GB. Over the next few years, another half billion Indians will access the internet using their smartphones. Establishing trust with this new user base will be key to ensure that products and services are effectively used by them. Vedantu reduces friction for their customers at several points by providing free trial classes to experience the product before purchasing and later providing after-purchase services. Their focus on providing a high-quality teaching and learning experience has helped to gain loyalty with both teachers and students, as is indicated by their high ratings. Vedantu’s group class format has allowed them to bring down the cost to students substantially while keeping quality and rigor high. Similar models have emerged in China with players like Yuanfudao and Zuoyebang who offer large, group classes at a fraction of the cost of individual classes, making it affordable for a larger segment of the population. With the growth of Vedantu teachers and students, we see the burgeoning potential of high-quality, interactive online learning. At Omidyar Network, we are focused on the opportunity to create better outcomes for every student, and we look forward to our journey with Vedantu as they continue to demonstrate effective models to do so.